How to find, identify, grow, and cook Chicken of the Woods mushrooms. Recently, while running errands, we happened to drive by one of our trusty chicken of the woods mushroom spots that has produced huge mushrooms at the same time each of the past 5+ summers. Bingo! Peering at us from the base of a large, dying oak tree was another giant orange chicken of the woods. 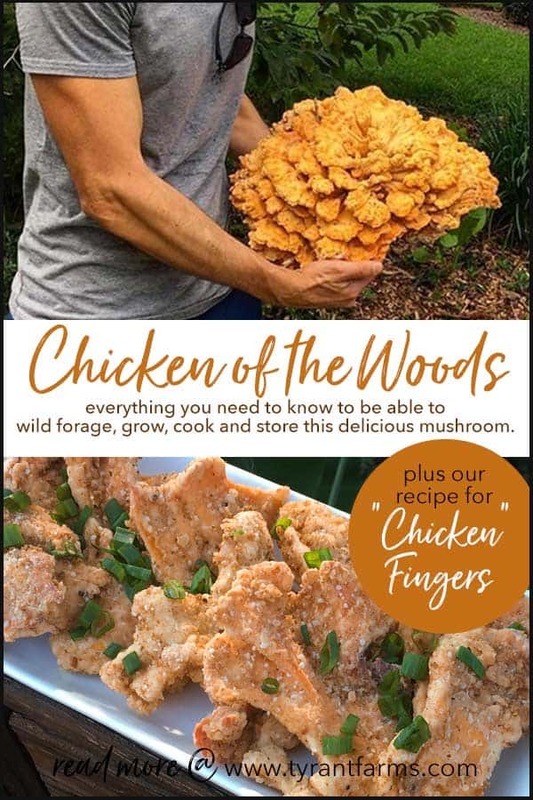 In case you’ve never heard of it, Chicken of the Woods is a large, incredibly tasty gourmet mushroom that has the same taste and texture as chicken. The Chicken of the Woods mushroom (Laetiporus cincinnatus) that we found. Sure, there are a bunch of unusual or exotic meats that people say “taste like chicken,” but there aren’t a lot of mushrooms that fall into that category. 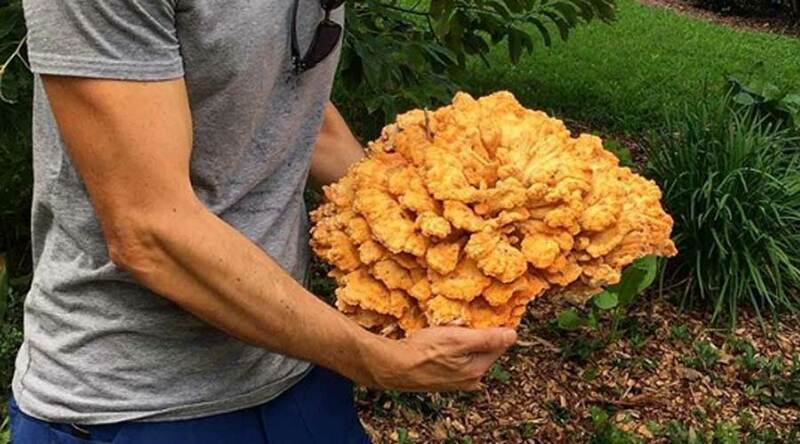 Just so you know we’re not full of it, we conducted a little experiment… Last summer, we served some breaded, fried Chicken of the Woods “chicken fingers” to a few friends and asked them to guess what they were eating. Homemade chicken fingers (from our chicken of the woods mushrooms) and honey mustard (from our neighbors’s bees). Nobody could believe these fingers were made from mushrooms, not chicken meat. Drum roll… they all thought they were eating really good chicken fingers—from a bird, not a mushroom. When we told them they were eating mushrooms, they couldn’t believe it. So, next time someone tells you that they “don’t like mushrooms,” ask them if they like chicken. If they say “yes,” then there is at least one mushroom out there that they’ll probably like. Before we get any further, a quick warning: you should never, ever eat a wild mushroom or plant unless you are 100% certain you’ve identified it correctly. There are plenty of mushrooms and plants that will kill you or make you very sick, and no meal is worth dying for. ALL varieties of Chicken of the Woods are edible and taste great, but some are better-tasting than others. 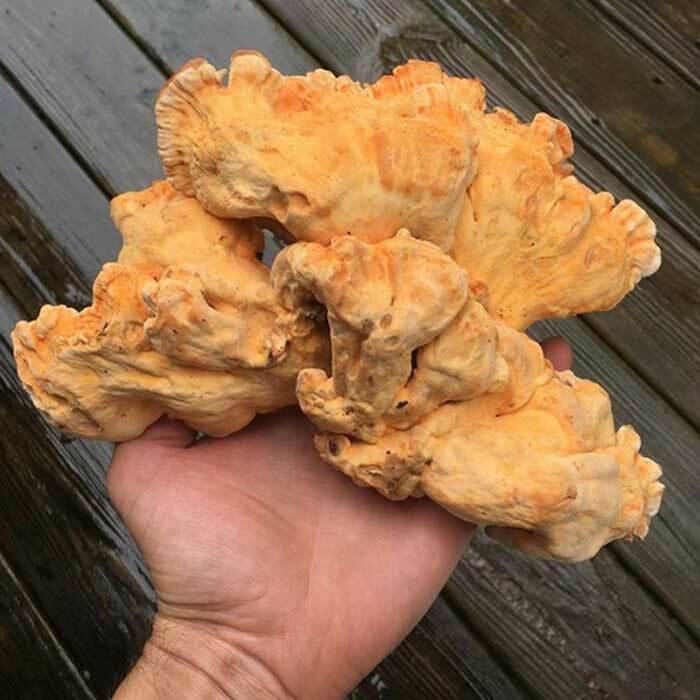 Luckily, our trusty spot about one mile from our home is a good producer of Laetiporus cincinnatus, a chicken variety that is considered by many to have the best flavor and texture of them all – or at least be a tie with Laetiporus sulphureus. A beautiful chicken of the woods (subspecies Laetiporus cincinnatus). While chicken of the woods is a relatively easy mushroom to identify, be mindful that you should always exercise extreme discretion when you’re new to foraging wild foods, mushrooms included. As mentioned above, there are plenty of poisonous mushroom varieties. Like plants, mushrooms fruit in specific seasons. Chicken of the woods mushrooms only fruit in the summer. In some areas they’ll also fruit into early fall. Chicken of the woods usually grow on oak trees, but we’ve also seen them on cherry, beech, and other hardwoods. Apparently, there are some chicken species that can grow on eucalyptus and cedar. It’s not advisable to eat chickens growing on this type of wood since the fungi uptake compounds from those tree species that could cause you GI distress. You’ll always find chicken of the woods growing on trees, stumps, or roots of dead or dying trees. Some species grow out of the above-ground portions of the trees, and some grow out of the base or roots. You’ll never find chicken of the woods out in an open field or growing on anything that is not a dead or dying tree. Regardless of the subspecies, chicken of the woods are always varying shades of orange/peach on the top (often streaked), and either light yellow or white on the underside/pore surface. Chicken of the woods does NOT have gills on the underside; instead they have tiny pores, where the spores are released. Unlike the familiar stem + cap mushroom shape that we’re all used to, chicken of woods mushrooms do NOT have stems. Instead, they either form large composite brackets or individual shelves. Chicken of the woods has a white spore print. To take a spore print, place one of the mushroom brackets pore-side-down on a glass surface or plate. After a few hours, enough spores will have been released to see their color. 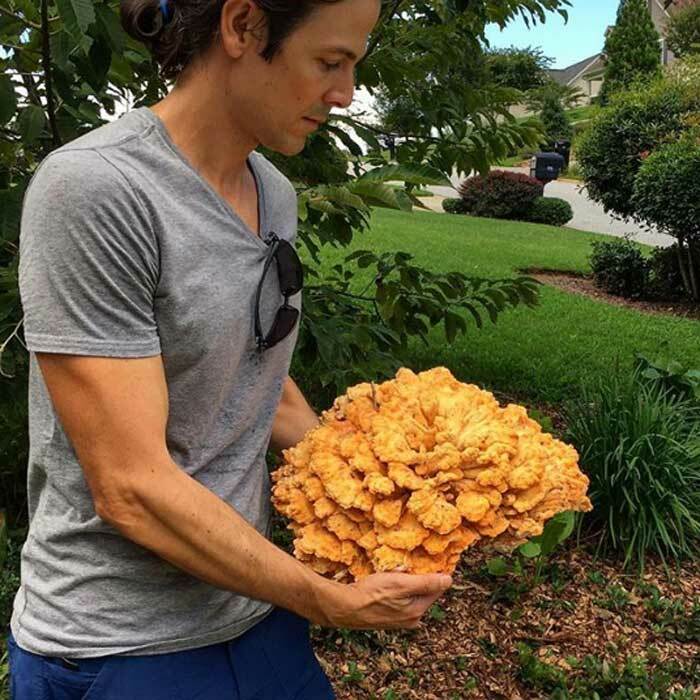 This means chicken of the woods (and other mushrooms) can serve as an awesome protein source for anyone looking for a vegetarian protein alternative. “contain a modest amount of fiber and over a dozen minerals and vitamins, including copper, potassium, magnesium, zinc and a number of B vitamins such as folate. Mushrooms are also high in antioxidants like selenium and glutathione, or GSH, substances believed to protect cells from damage and reduce chronic disease and inflammation. We’ve found a chicken of the woods mushroom fruiting from the same spot ever summer for the previous 6 summers. There’s an old oak tree nearby and the mushroom is fruiting out of its roots, which are just below the ground. First, plan ahead. 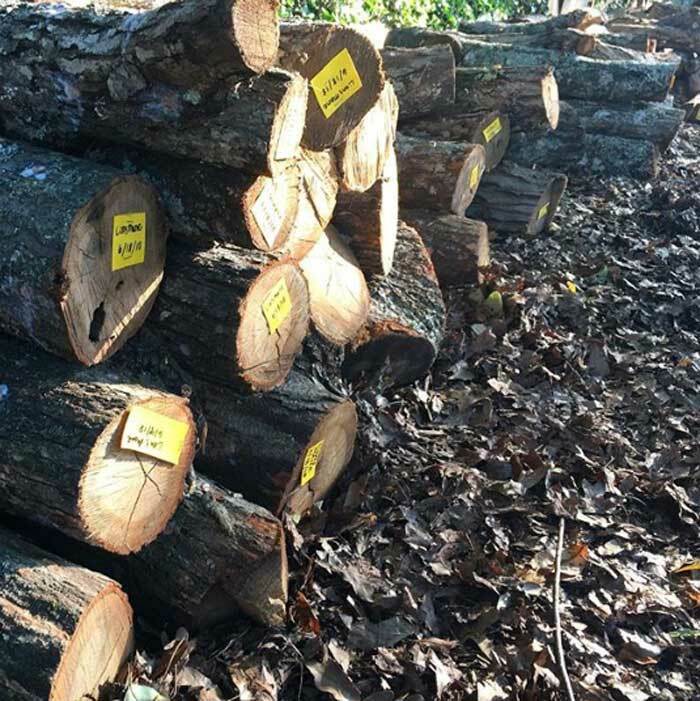 Do you have access to freshly cut hardwood logs or a newly cut hardwood tree stump? You’ll want to use wood that’s either just been felled or hasn’t been dead for more than a couple of months. The longer a log sits, the more that other fungal spores will have landed on it and begun to colonize it, which means more competition for your chicken of the woods. You can buy chicken of the woods spawn plugs here. See instructions on Amazon to determine how many spawn plugs you need to buy based on the amount of wood/logs you have. Drill holes, insert spawn plugs, then cover each finished hole with melted wax. Just melt on the stove in a cheap aluminum pie tin using a paint brush. You don’t want to inoculate during the middle of freezing temps. Ideally, you still have at least a month ahead with no freezing temps on the forecast to ensure your chicken of the woods gets a nice jump start. 5. Position your logs and wait. Put your finished logs outdoors into a full shade spot and wait. If you don’t get rain once per week during the warm months, water your logs with a sprayer to keep the chicken of the woods mycelium happy and growing. How long does it take chicken of the woods logs to make mushrooms? It may take 6 months or more for the first fruiting, depending on what month you started your logs (chicken of the woods won’t fruit until summer). After that, you should get mushrooms each summer for 3-5 years depending on how large your logs are. Once the mushroom runs out of food (lignin in the wood), they’re done. When you see small chicken of the woods mushrooms starting to fruit on your logs, prop the logs upright against a railing, wall or other structure. This allows them to grow larger unimpeded, and also keeps them from growing into the dirt. It’s important that you keep the logs shaded and well-watered while they’re fruiting to ensure the largest, softest chicken of the woods mushrooms possible. It’s up to you to determine when to cut them off of the log. We recommend not waiting more than a week. It’s a balance between size and tenderness. Want to grow your own medicinal protein? Start a mushroom log garden! If you’re growing multiple varieties of mushrooms, make sure to label your logs so you can keep track of who is who. How much are chicken of the woods mushrooms worth? How much do they cost? Thinking about selling some of your chicken? Chefs/restaurants will buy gourmet mushrooms for anywhere between $12 – $25 per pound (or higher for unique species). Chickens fetch the higher end of that range, around $20 per pound. If you happen to find them selling at a retail grocery store/co-op, you can probably expect to pay $25/lb or higher. Now that you’ve got your chicken of the woods mushrooms, it’s time to eat! 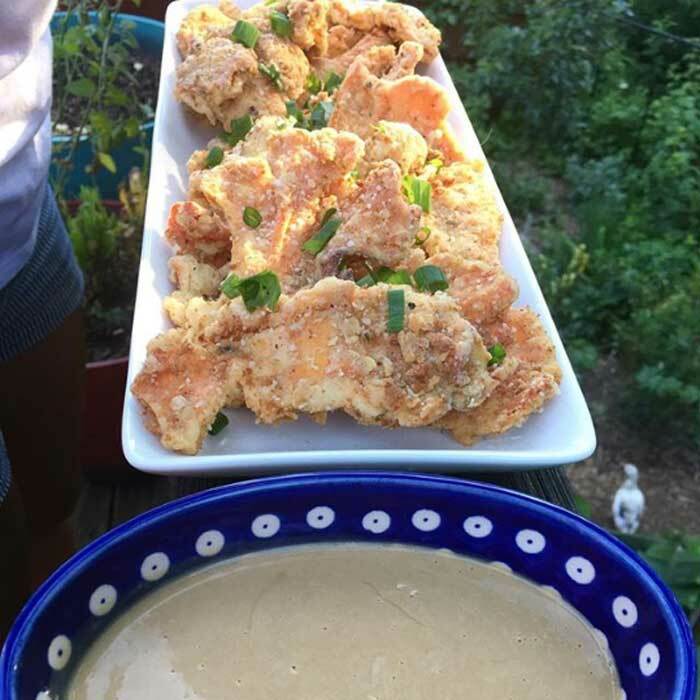 Our favorite way to eat chicken of the woods is to lightly fry them into chicken fingers (see recipe below), then dip them in homemade honey mustard. They’re also excellent as a chicken substitute in Asian stir-fry, chicken parmesan, or any recipe that calls for chicken. Chicken of the woods remains firm and surprisingly meat-like when cooking so no substitution or math required. If a recipe calls for 1 cup of actual chicken, simply use 1 cup of chicken of the woods instead. Aww, how adorable. A small chicken of the woods found early in summer 2018. Can you eat chicken of the woods raw? As mushroom expert Paul Stamets details, it’s not a good idea to eat any mushroom raw. For starters, cooking mushrooms breaks down their cell walls, making their nutrients available and also making the mushroom more easily digestible. Cooking also kills any potential pathogens and breaks down heat-sensitive toxins in the mushroom. Can you be allergic to chicken of the woods mushrooms? Yes. People can be allergic to virtually anything, including chicken of the woods mushrooms. The first time you eat chicken of the woods or any new food, only eat a small amount before going all-in… And make sure you cook it first! How long will chicken of the woods last? We’ve had chicken of the woods last for over 3 weeks in ziplock bags in our refrigerator’s veggie drawer. Can you freeze chicken of the woods? If you find them growing under perfect conditions on a large tree or log, you can harvest huge quantities of chicken of the woods. If you have more than you can possibly eat or store in the fridge, chop your chicken into pieces that will fit in freezer bags, then stick them into the freezer. They freeze quite well and doesn’t seem to have their flavor or texture significantly impacted in the process. You can also dehydrate chicken of the woods, but we recommend freezing as the best long-term storage method to preserve the best flavor and texture. Put 1/2 cup of flour in a medium sized bowl. This is your "dredging" bowl. You'll want to get a light dusting of flower on the entire outer surface of each mushroom before you dip in the milk/egg mixture. Add your egg and milk into another mixing bowl, and whisk together. You'll dip your dredged mushrooms into your egg/milk mixture before placing them in your frying mix. Prepare your frying mix by putting all dry ingredients (flour, spices, etc) into a large bowl. Whisk them together until evenly blended. Once your mushrooms have been: 1) dredged, and 2) dipped in your egg/milk mixture, you'll drop them into the big bowl of dry ingredients and cover them evenly. Once uniformly covered with fry mix, shake off any extra fry mix. We like to place them on a drying rack on top of a cookie sheet until we're ready to put them in the fryer (you can just use a plate if you'd prefer). Heat your cooking oil. Our stove top doesn't cook particularly hot or cold, so we put it on about 4.5. You'll know your oil is hot enough when you drop a bit of flour in and it starts sizzling. Allow them to cool for a few minutes, then serve with your favorite chicken finger dip! Our favorites include homemade Honey Mustard (made from honey from our neighbor's bees) or a rich BBQ sauce. Happy growing, happy foraging, and happy eating! Please share this image on Pinterest if you enjoyed this article!